A little over a week ago I did my first confined water shark dive. I mean, at the Aquarium, technically all the dives are confined, and there are sharks in the exhibits I’ve been in, but this was a little different. Shark Lagoon is where the big sharks live together, and only sharks. It’s a privilege to be allowed in with the big boys (and girls), and I was given the opportunity to drop in and scrub a dub dub the tank to keep it all shiny and nice for the guests (and the inhabitants). Of course, one does not just “drop in” with these babies, one must review certain material, and certain personal feelings and anxieties before one “drops” anything. The material I read stressed safety first. It stressed that there had been no incidence with the sharks. And it stressed that I needed to keep a 3 foot distance between me and my diver and los tiburones. and it stressed CONSTANT VIGILANCE (cue Mad Eye Moody). I felt excitement to go in, because as you may know, I love the sharks. But I didn’t know what it would feel like to be IN a confined space where everybody that was in there, excluding me, was a shark. As people, we have a survival instinct. And it feels weird to voluntarily go into a fish bowl filled with large predators. Top of the food chain type people. It’s easy to love things from a distance, but it is another story to love them up close. Everything done in the shark tank is cleaning. The feeding is done when there are no divers present, for obvious reasons. Which means, diving with the sharks is hard work. 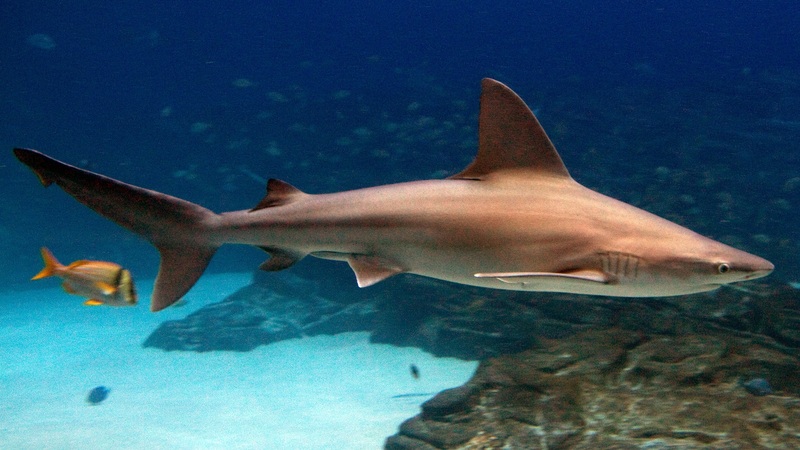 Not because they’re sharks, but because the Hydro-vac is heavy, and the window is pretty big, and because you have to keep a 3 foot radius between you and everyone who is swimming around, which is everyone (minus a very sleepy Nurse Shark). whatevs you guys, I have other business to attend to. What I came to realize very quickly is that these sharks are fat and happy. They are lazy. But they still have the capacity to do their sharkly duties, and as such must be taken seriously. Dogs are cute too, but they can still bite. What I found worked best for me was to focus on the task at hand, and let my safety diver do her work. The sharks were curious about the smells we were lifting up out of the sand, and they were coming in as close as they could to investigate. But they were also just going about their normal lives. The sand tiger was swimming his laps, and sort of in a very zen like trance. If you got in his lap, well, that was your problem, not his. His mind was thinking about something else, not keeping a 3 foot radius in between you and him. That’s your job. His job is “shark”. And because we were all in such a small space together, we had to learn how to deal with each other. Shark Lagoon can be a metaphor for our ocean, though. In all honesty, it is their ocean, and when we drop in, we must read the safety manual and demonstrate caution and respect. Stingrays sting, and sharks eat, and fish swim, and they will continue to do so whether I am standing there, or diving there, or not. They don’t care, so long as I’m not there to screw with them. So yeah, I felt anxiety. And the more I do it, the less anxiety I’ll feel. THe more familiar with personalities i will get. LIke the Black Tips roll around in groups, getting close to investigate. The Sandbar can go very fast. Reticulate whip ray doesn’t always move. Nurse Shark makes sure to have his nap in the most inconvenient place possible. 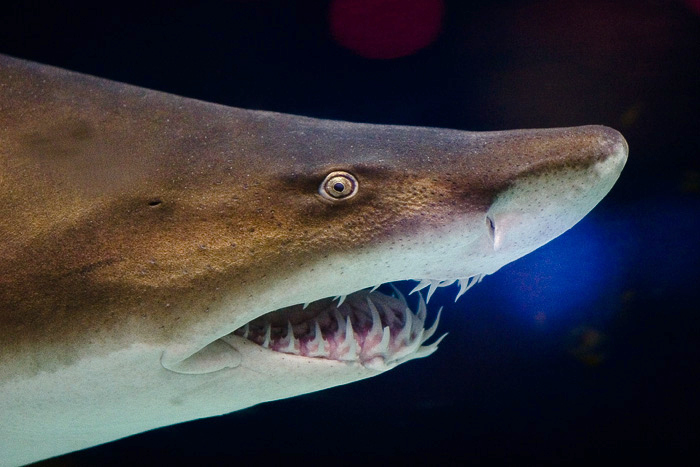 Sand Tiger shark swims and sometimes chews the glass, and can be spooked easily by too sudden of a movement. But one must always respect seniority, and territorial rights. That has to be the most exciting aquarium cleaning ever. I miss diving with sharks. I’ve seen one real shark (nurse sharks don’t count) since I got here. 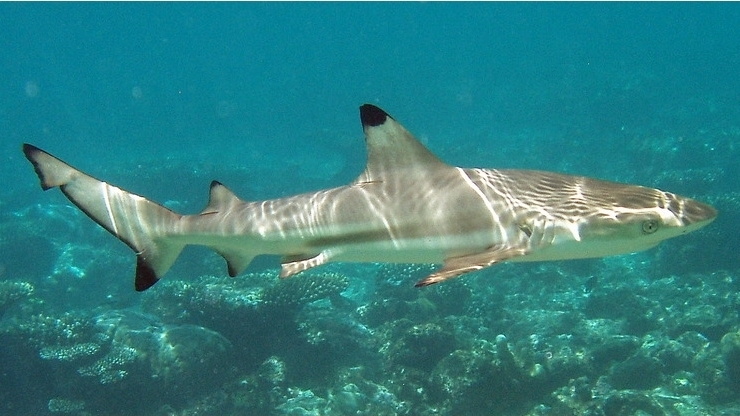 At least the shark I saw was a hammerhead.